“Tog”, “white chin” and “black fish” are all common nicknames for this fish. Tautog are very slow growing compared to most fish and do not migrate far from where they originate but move inshore in the spring and offshore in the winter. Location: Whole coast, rocky bottoms inshore, bays, harbors, jetties, breakwaters. Baits and Lures: Crabs, clams, all shellfish. Methods and Tackle: Still-fishing from boat or shore, medium action spinning or conventional rod, 20-30 lb test line. Mass. Saltwater Fishing Derby Minimum Weight: 8 lb. Whether you call it tog, blackfish, or white chin, tautog are a really fun fish to target and catch in Massachusetts waters. There are few fish that will fight with as much vigor as a tautog, and if you are able to hook into one on your local rock-pile you will feel their power and strength before you can get them to the boat! Ranging from Canada to South Carolina, tautog are largely targeted by recreational anglers from Massachusetts to North Carolina. Historically, the recreational catch of tautog was the vast majority of the total annual catch, but the commercial fishery for tautog has increased with the rising demand for live fish in certain markets. Tautog are members of the wrasse (Labridae) family. The coloration of individuals varies widely and is usually dictated by their juvenile habitat (growing to closely match their surroundings). Body colors range from gray to olive green and also brown and black, and juveniles may also have banding bars of varying color. As mature fish, the colors are most often brown to black with little to no patterns, with the largest fish exhibiting white chins. Tautog differ in shape from their much smaller relative, the cunner, in that their body is more stout and the head is highly arched, as opposed to the more pointed head of the cunner. Tautogs are slow growing and in Massachusetts can live to around 20 years. Males and females are sexually mature at three to four years of age but often don’t reach recreationally legal size until around seven years. The growth rates for tautog vary greatly in Massachusetts waters, with a wide range of ages represented in many different size classes of fish. 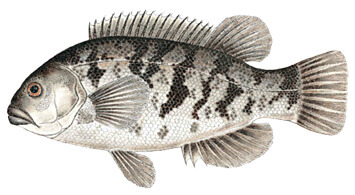 During spring, as the water warms, tautog migrate inshore to spawn in nearshore coastal waters. They may remain inshore throughout the summer, then move to deeper (80- 150 feet) offshore wintering areas as fall approaches and water temperatures drop below 52° F. Toward the southern end of their range, some adults may remain offshore throughout the year. Tautog are voracious feeders, preferring shellfish and other invertebrates as adults. They are often grouped around structures such as rock piles and boulders and are quite territorial. Evidence suggests that they remain close to a singular “home” site for prolonged periods but may move short distances away to feed if necessary. If you are lucky enough to find a group of tautog, you can often catch a lot of fish in a small area in a short amount of time. The bait of choice for many Massachusetts anglers is green crabs but they can be caught on other crab species as well. With a firm white flesh and delicate flavor, tautog filets are delicious when baked or grilled and also hold up well in chowders. When combined with its sporty catch behavior and proximity to inshore waters, tautog is sure to become one of your favorite fish to catch and eat for years to come!